The Princess Bubblegum Official Stamp Of Disapproval. Adventure Time is a cartoon on Cartoon Network that is impressively popular, not to mention downright bizarre. As expected with any popular craze, it has merchandising! Hats! Socks! Personalized catheter bags! 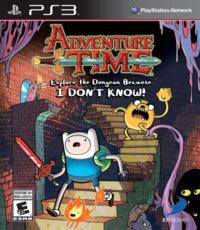 And yes, EVEN video games, including Adventure Time: Explore The Dungeon Because I Don't Know for PlayStation 3, Xbox 360, Wii U, PC, and 3DS. I'll be checking out the PS3 version because it's the one burning a hole on my coffee table. AT:ETDBIDK throws a brief plot your way, in which Princess Bubblegum invites Finn and Jake (followed by Marceline the Vampire Queen and the probably delicious Cinnamon Bun) to check out the prisoner dungeon below Bubblegum Castle. Prisoners have begun to escape, despite the dungeon actually being purposely inescapable. When prompted as to why all this may be occurring, the Princess shouts "I don't know! ", and everybody playing the game goes into a frenzy because THAT'S WHAT IT SAYS IN THE TITLE OHHHH MY GOSH THEY SAID THE THING—and then you're given a brief tutorial of how to walk around (something that still apparently needs a tutorial), use a weapon, and block projectiles. Good. Now, off to the dungeon with me. 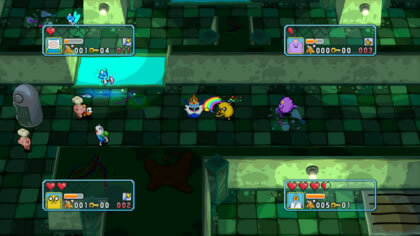 You can play as four different characters initially (Finn, Jake, Marceline, and Cinnamon Bun), but more are unlockable, including the Ice King and the Lumpy Space Princess. Peppermint Butler is also available as DLC. I'm not buying DLC for this. Each character has their own specific abilities. 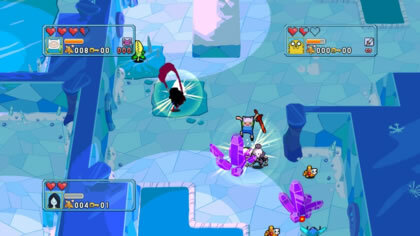 Ice King, for example, can freeze enemies, while Marceline can hover over pits in the ground. This game had a retail price of $39.99 back in 2013. For a brand new PlayStation 3 game, that's an acceptably decent price. But for THIS game, it should be less. A LOT less because they sure didn't pour a ton of development money into it. The term "explore the dungeon" is in the title of the game, and there's a very good reason for that: dungeon crawling is pretty much all you do. Either by yourself or with a crew of up to four players, you'll be tasked with diligently exploring each and every floor of the 100-level dungeon beneath Bubblegum Castle. By yourself, it's a chore; you're responsible for every ugly skeleton, every item on the ground, every bird with a death wish, every treasure box, every weird box of fries laying in a grimy sewer-like dungeon. You'll probably get lost, too; the map function is as basic as it gets: a gray square with only the most minor of details, like where you are and where the stairs leading downward are... provided you're fairly close to them. It's far more satisfying with a few friends around because everyone can make the journey go by as a quicker pace. You can anticipate an almost unbearable amount of slicing your way through a slurry of mundane enemies and treasure boxes filled with nothing of interest. Honestly, by the fifth level alone, it already becomes taxing. Even fans of roguelike adventures such as this may begin yawning themselves into an early coma. Life can be made slightly easier with subweapons found within the dungeons, though your sword will still serve as the primary method of attack. Want a bamboo pole to swipe around? Care for a rainbow whip? Feel the urge to fire kittens from a bazooka? Need something called a "Poot Newt"? All of these are possible, as examples. As well, before entering a dungeon, your character can equip up to three tokens to improve their stats. That can come in handy because in later floors, you'll feel more vulnerable than a shaven lemur without them. That's... quite a zoomed out game you've got there. We must remember it's not the loot in the classy green treasure boxes or the random chicken drumstick drops you're really after. No, it's the piles of gold, doubloons, and other trinkets of awesome-sauce found either just laying around or dropped when defeating a major enemy or spawning point. These are the things you want to collect! These are the only things you would want to explore the dungeon for, as they act as the game's currency. Once you head back to the surface, you can use all them purdy coinages to either purchase stat upgrades to your character or items to take down to the dungeon later. This system would be great if it weren't for the arbitrary Candy Tax imposed by Princess Bubblegum, one of the dumbest design decisions this game could have made, aside from... well, the rest of it. Basically, once you come back to the surface (and you are forced to after any floor ending in zero), you bring back all the treasures you acquired from your previous trek. Whatever you don't spend, however, is immediately forfeited to the princess when you go back to the dungeon, forcing you to spend it all whether you want to or not. In many cases, there's nothing worth buying, and there's nothing useful you can afford. If you're just one or two treasures away from getting that strength or life meter upgrade you so sorely wanted or needed, tough nuggets! Why there isn't a bank or even a treasure depository, I have no idea. But it makes the treasure hunting aspect feel so useless and a waste of time. Yet despite all these issues, there's one that tops them all and made this a very quick and easy game to play: nobody bug-tested this bleak pyramid of rodent feces. The PlayStation 3 version is an absolute beast when it comes to freezing during a loading screen or even hardlocking your console, requiring a hard reboot. I was having these issues so frequently that I simply gave up playing. When there are freezing issues EVERY time you play, forcing you to lose all of your progress, the motivation is gone. Even with a patch forced upon me, these issues still lingered. It's an incomplete mess. I just restarted my console and popped in Katamari Forever instead. Good times, rolling up the Taj Mahal. Graphically, it will be pleasing to those who enjoy a retro style, as everything it designed to look like the days of the NES or SNES, depending on what part of the game you're looking at. It's quite pleasant to look at, and considering developer WayForward is familiar with using sprites, this style is not surprising. Audio-wise, expect a slew of classic voices from the show, as well as music that's rather decent, despite being sometimes well-hidden behind slashes and embittering one-liners from your character whenever they pick up something. "Nothin' like dungeon food!" You bet, Finn, you bet. Adventure Time: Explore The Dungeon Because I Don't Know! had potential, but it's been lost somewhere. That's a shame because it tries hard to sound and appear like a genuine Adventure Time episode with witty banter and references, but in the end, it's a glitched-out tedious sludge that I had to walk away from. It's more like Buy This Game Because I Don't Know! But now I know: don't buy it.